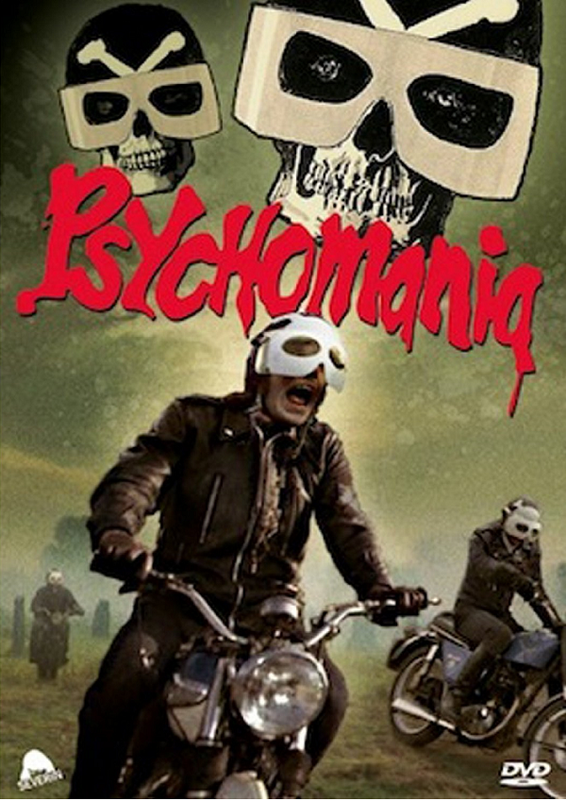 DVD Review: Psychomania | "DESTROY ALL FANBOYS!" 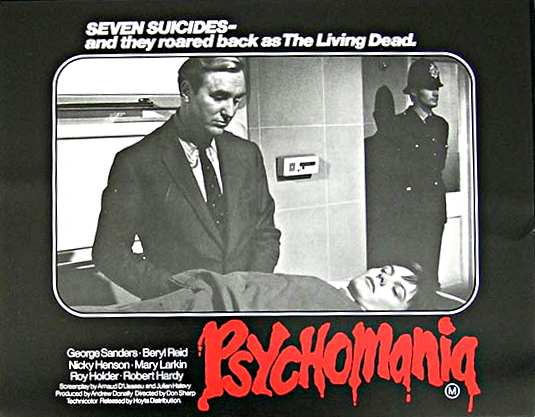 For all its excesses, grand stunt work and mystical frog-centric semi-satanic psychobabble-mania, the film just feels very dated to this weary writer. Even when I saw this on TV as a kid (Either on WPIX’ Chiller Theater or WOR’s Fright Night, I believe), something seemed “off” about the movie. Maybe it was the oddball fact that the “violent” biker gang stuff The Living Dead gang does pre-suicide was more or less public nuisance nonsense and hooligan property destruction shenanigans as opposed to the undead killing sprees they tackle once they’re invincible. Maybe it was the ironic goofiness of Tom’s funeral scene where a guitar playing hippie type warbled out a gentle flower power type song instead of some early heavy metal or hard rockin’ doomy-gloomy tune for the dead tough guy. Maybe it was George Sanders playing his final role a wee bit too aloof here, knowing full well that he’d take his own life for real not too long afterwards? Who knows? There’s certainly nothing wrong with Don Sharp’s direction, as the film gets to its points with ease and all the actors do what they need to in their roles. The problematic Abby does come off as a wee bit too goody-goody to be a biker chick. But then again, the only other gal in the Dead is the lovely Jane (Ann Michelle) who’s only distinguishing characteristics are she gets some snappy lines and wears a standout red leather jacket. The biker gear here is tops, mind you. Perhaps the film is a wee bit too professionally made, if that makes any sort of sense? I can’t put a finger on exactly what’s “wrong” here, but the moving finger writes (ha and ha) that this one just feels it’s missing something… “special” to thrust into the land of more infamous horror flicks. 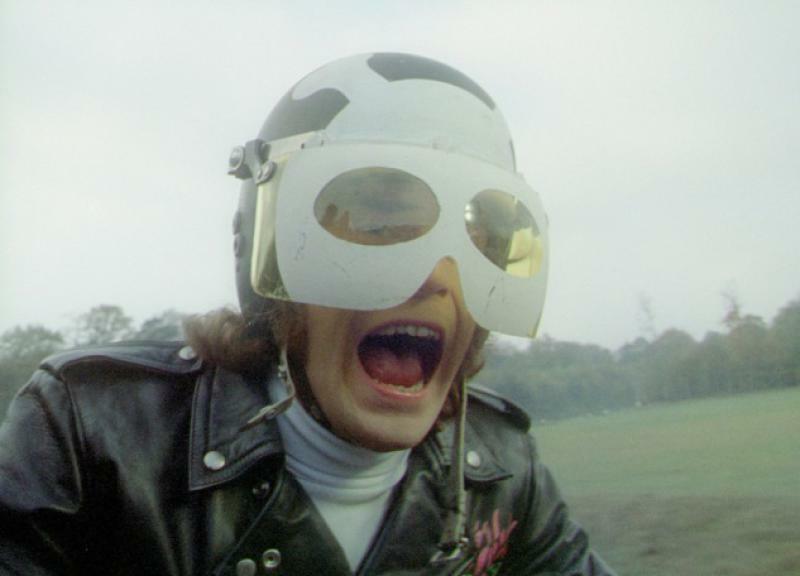 After all, Kubrick’s classic A Clockwork Orange was made before this, yet the best Psychomania can do is give us Latham’s weak Tom aping Malcolm MacDowell’s Alex to lousy effect. 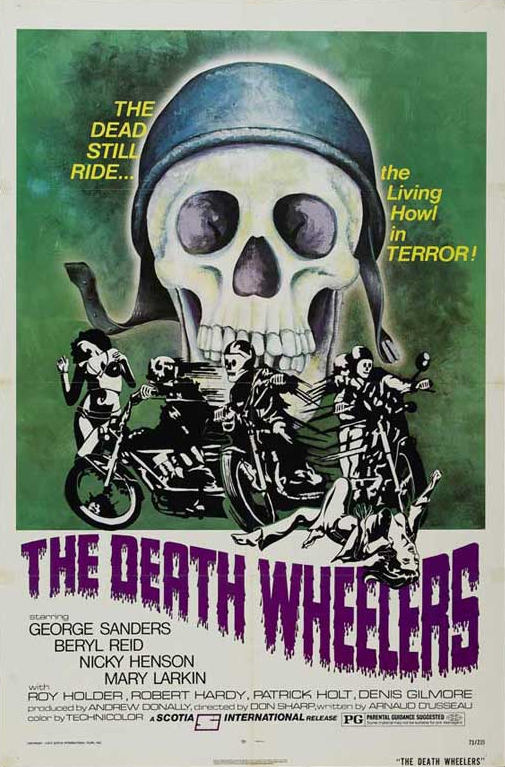 The Living Dead may look cool (yeah, I give the film an A+ for those distinctive helmets, leather gear and the good looking, too old to be teenage delinquent bikers), but the campy comical manners in which they snuff themselves out make the laughs come at the film’s expense. Still, for all my complaints the movie makes enough of an impression to recommend if you grab the now out-of-print Severin Films version or if you’ve a region-free player the recently released (9/16) UK-only Region 2 BFI/Flipside Blu-Ray that has what I hear a stellar 2K restoration the older disc doesn’t. Of course, your mileage may vary based on your taste for this sort of flick that straddles a few lines, doesn’t cross many and at the end of the day, is more an oddball curiosity piece with a somewhat loyal following. Or: Dude, I think you’d actually dig this chunk of aged Stilton. Go check it out and dig it for what it is. 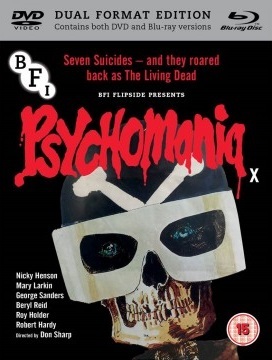 This entry was posted in 2016, Commentary, DAF, Features, Humor, Updates and tagged 1973, BFI, Blu-Ray/DVD, Horror Films, Movie Reviews, Movie Trailers, Nostalgia, Psychomania, Reviews, Severin Films, YouTube by geelw. Bookmark the permalink. I agree on the off-kilter nature of the story’s execution, and that oddness is probably the reason for the movie’s cult. My major animosity toward it was I perceived a killer (no pun intended) plot twist coming which never arrived. I guess that means I can use it myself, somewhere. If I ever make a movie about living dead motorcycle punks. This was supposed to go up last night, but I actually fell asleep writing it! Yeah, I think that’s what I wanted as well, but the only twist is the film keeps an even keel from start to finish. I guess a remake is in order if some director can make a better and actually scary take. That may be the only time I say this, as I’m against some remakes entirely (Suspiria! ).